This circuit is typical for many cable cylinder speed control applications. 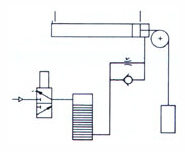 The cylinder stroke in this schematic is common for GREENCO units. Energizing solenoid "A" flows air through the 4-way valve and ball check to piston. As the piston moves to the right the trolley attached to the load moves to the left. Air inside the cylinder is forced out through a metering valve. This circuit maintains a constant back pressure on the piston an prevents lunging if the load drops quickly or reveres. Metering-in and bleed-off circuits work well when their application is required. 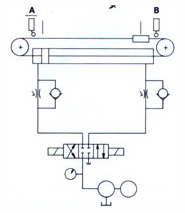 This circuit incorporates a high pressure hydraulic cable cylinder. Oil is supplied form a hydraulic power supply at 500 PSI max. to a 4-way valve. 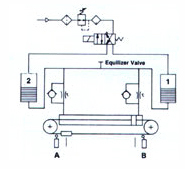 Energizing solenoid "B" flows oil through a ball check to the cylinder's piston. Oil inside the cylinder is regulated out for effective speed control. Energizing solenoid "A" reverses the cycle. All seals within the cylinder function more effectively with hydraulic fluid added lubrication at these pressures. This circuit combines the rapid operation of pneumatic circuits and close control available in hydraulic circuits to form effective machine circuits. This system is economical because an adequate air supply is usually available. 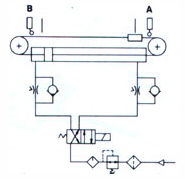 Energizing solenoid "A" air flows through the 4-way applying pressure on the oil in tank No. 1. Oil flows through the check valve to the piston moving it to the right. Oil inside the cable cylinders regulated out by a variable flow control valve. This circuit gives fine speed control. This circuit incorporates a single-end CABLE-TROL unit when gravity is used to lower a load. The load may be a heavy door or something similar. Hydraulic speed control is needed, however, rather than employing a hydraulic unit to power the system, a more economical air system is used. To raise the load, the 3-way valve is activated opening the reservoir to air pressure. Oil is forced form the reservoir, through the check valve, and into the cable cylinder forcing the piston to the left and raising the load. Reversing the 2-way valve, air pressure is blocked and gravity lowers the load at a rate of speed governed by variable orifice.